We have quite the grab bag for you on the show this week, as we discuss topics as wide-ranging as the passing of beloved Japanese director Isao Takahata, a true pioneer of the medium, to something as silly as Sean ranking all the Spider-Mangames he has ever played to celebrate the release date announcement of Insomniac’s Spider-Man PS4 game. Jonathan also talks about his adventures re-watching Yu-Gi-Oh! in Japanese, Sean gives final thoughts on Far Cry 5, and we talk about the first two episodes of Persona 5 The Animation. We even bring Jonathan’s brother Thomas on to talk about Persona 4 Dancing All Night and the upcoming Persona 3 and 5 dancing spin-offs, given that Thomas is currently #1 in the leaderboards on most P4D songs. And on a personal note, I (Jonathan) have some big life news to share on the podcast this week. I talk about it more on the show, but in short, I have been accepted to a PhD program in Film Studies at the University of Iowa, and will be moving later this year to attend. No, it does not mean the end of the podcast, though we’ll probably have to do some experimenting to make the transition from ‘two guys in a room with one mic’ to ‘two guys in two different states over the internet.’ Neither Sean nor I are all that worried – plenty of podcasts record this way! – but it will be a bit of a change, and if you’ve got any tips, we’d be happy to hear them! 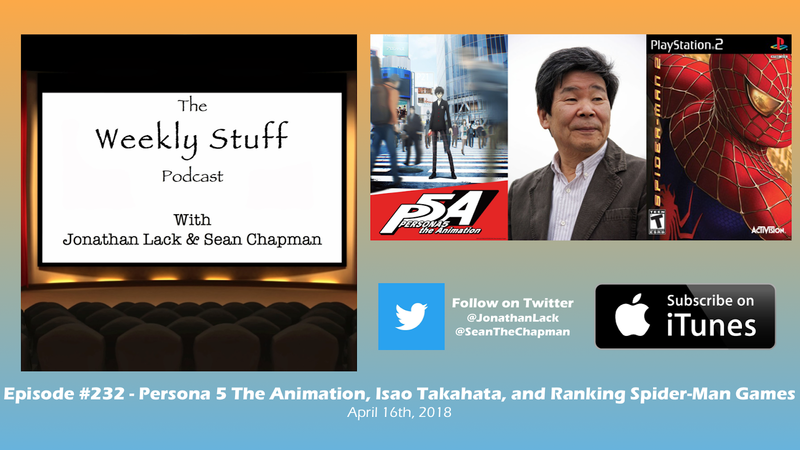 The Weekly Stuff with Jonathan Lack & Sean Chapmanis a weekly audio podcast, and if you subscribe in iTunes, episodes will be delivered automatically and for free as soon as they are released. If you visit www.jonathanlack.com, we also have streaming and downloadable versions of new and archival episodes for your listening pleasure.